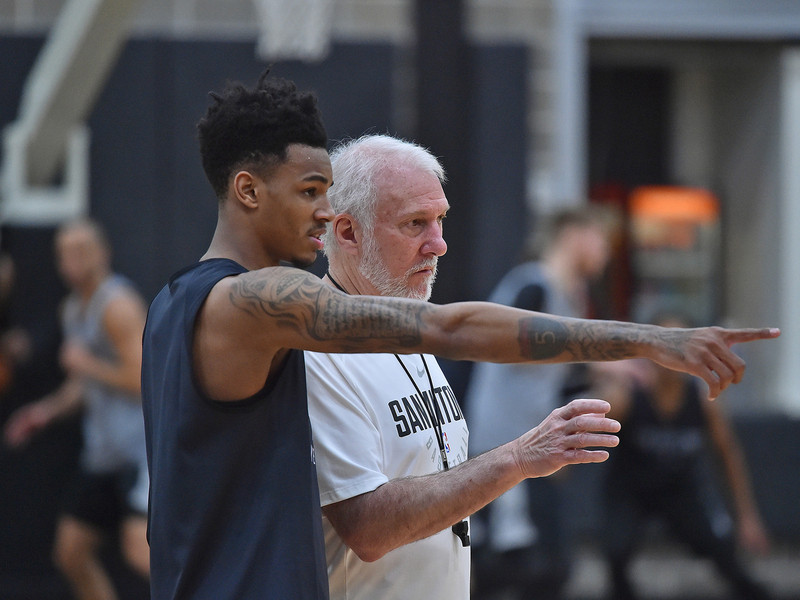 Always part of the Spurs' future plans, Dejounte Murray's hot start to 2017-18 is beginning to make him look like part of the now. It’s rare for the start of a given Spurs season to be characterized by anything more than a stony Gregg Popovich gaze, or maybe a few extra passes. If you’ve seen the Zapruder-esque video circulating of Kawhi Leonard struggling onto the team plane, you know the cloud of injury has changed that. San Antonio is still 3–0 (because of course), but has adapted especially well in the absence of two stalwarts in Leonard and Tony Parker. The biggest surprise is that much of San Antonio's spark has come thanks to 21-year-old point guard Dejounte Murray, an atypical system fit whose creativity and all-around contributions have made quite the difference. It’s no secret the 2016 first-rounder has been a piece of his team’s future, but he’s beginning to look like part of the now. We see this process in football all the time: the veteran quarterback goes down and is replaced and eventually supplanted by the unheralded young backup. It would fit neatly save for the fact that Murray has leapfrogged Patty Mills, landed a starting spot and has visibly been one of the Spurs’ best players out of the gate. The last guard to inherit this much responsibility in San Antonio was Parker, and we all know how that went. But with the context of all that’s come before him, Murray’s growth takes on some added importance. Through three games, he’s averaging 13.3 points, 4.7 assists, 9.7 rebounds and 1.3 steals, the latter three all tops on the roster. He's done it playing a probing, freelance sort of style that's at times a far cry from Spursian ethos, and with a youthful verve that's upped the entertainment value. What's more, it actually appears Pop has a visible soft spot for him, which makes things all the more amusing. These very early contributions and the rate at which success has come to him poses a sort of chicken-or-egg conundrum: is it the San Antonio machine at work, or might Murray be a different sort of beast? The answer is probably a little bit of both. “He’s just a baller,” one optimistic scout told me going into the 2016 draft. If that sounds familiar, consider that Murray grew up in Seattle, where NBA-caliber playmakers would seem to grow on maple trees, and where he became one of many young players to emerge under Jamal Crawford’s wing. There, he was known as “Baby Boy” and burst onto the scene at the Seattle Pro-Am, where he dropped a 43-point game in the summer of 2014 in a game that included Crawford, Chris Paul, Matt Barnes and Spencer Hawes. Basically all of his Instagram posts are about basketball, and some of them don’t even have captions. In a lot of ways, he appears a chip off of Crawford’s block. After a year at Washington, Murray entered the draft as a first-round caliber prospect, but was aptly characterized as a raw talent. Scouts appreciated his size (6’5”), aptitude and ability to make plays off the dribble, but poor shooting numbers, a thin build and a frustrating Huskies season all contributed to his draft-night slide to the 29th pick. His efficiency on jumpers was especially poor at 0.777 points per possession, a number that fell to just 0.576 on shots off the dribble. He was turnover-prone at times, although his mistakes were often out of aggressiveness, not for lack of awareness. It was unclear to some if he would be anywhere close ready to handle lead guard duties at the NBA level, and he was the second-to-last player in the green room at the Barclays Center when the Spurs finally called his number. He wasn’t even the first guard off the board named Murray (that honor went to Jamal). To be fair, it’s become a bit of a trope to label every San Antonio draftee as a steal, but fast-forward a year or so and, well, yeah. By the time Parker gets back (which could come as soon as November), it’s possible that Murray will have already forced Popovich’s hand. He’s played with poise on both ends of the floor, distributes well in transition, and the uptick in rebounding would seem at least somewhat sustainable. He averaged six per game at Washington and makes use of a wingspan lengthy enough to be legitimately debated on the Internet (DraftExpress had Murray’s measurement at 6’9” before that draft, a quick Google search has it at 7’0”, various stories place it somewhere in between). The jury’s out on his jumper, though he’s not shooting many threes, anyway. The Spurs have had a little success developing players in that area, after all (See Kawhi Leonard). Though perhaps not out of nowhere, the emergence of a lesser-heralded, oversized, do-it-all guard this early in his career is quite a twist. Maybe it’s just what a full year of player development can do for a kid who had hardly been coached. It’s not clear exactly where Murray will fit into a healthy rotation, with Parker of course having earned his minutes and Mills entrenched to a lesser extent, and his lack of three-point range makes it trickier to just slide him into lineups. But Popovich has praised his defense and might be pressed to get creative as the Spurs continue to reckon with small-ball leanings around the league. Murray has looked dynamic in the earliest of goings, and will have ample opportunity to strengthen his case as both the short- and long-term answer in the days to come. His team could be that much more dangerous for it.